A distinctive-looking, well put-together double-cut with a flexible set of sounds. The colour choice won’t please us traditionalists. All the recently-released AZs, as you’d expect, are based around the classic 648mm (25.5-inch) bolt-on scale length. There are both 22- and 24-fret models in both Prestige and Premium lines: the 22-fret models have an HSS pickup configuration and a Strat-meets-RG-style scratchplate; the 24-fret models have dual direct-mount humbuckers with no scratchplate and rear-mounted electronics. Bridge positions are the same on both 22/24-fret platforms, the 24-fret neck therefore sits slightly deeper into the body and as a result the treble cutaway is slightly deeper, too. Here, we’re looking at the Premium AZ224F-BIG. are far from vintage spec. The humbuckers impart a thick but not overly dark voice; the single coils, despite that overwound reading, sound full but nicely contrasting and well-balanced in context. 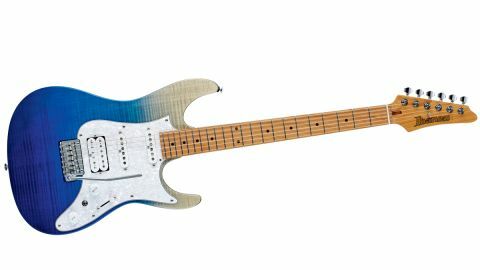 Hugely interesting, this AZ model might well surprise many players who’ve pigeon-holed Ibanez as shred guitars for the masses. It certainly does that with plenty of potential for Floyd Rose-style whammy tricks (without the hassle of locks) but the Prestige models in particular would get you through a more conservative covers gig, no problem. In fact, with the expansive switching systems on both the HH and HSS platforms there are plenty of credible sounds for players never intending to hit the high-gain channel. If Ibanez had added a proper tap - perhaps via a pull/push switch on the tone - to pull down the heat of the ’buckers for a more vintage spec voice, it would have created the near perfect hybrid. But, as is, for the player wanting to cover virtually everything from jazz to shred, well, they’ve pretty much done it. This is a seriously versatile, good-sounding, tidily made instrument that deserves to put Ibanez squarely back into the mainstream.